Chrichton's World: Review Just Heroes a.k.a. Yee daam kwan ying (1989): Believe it or not Just Heroes is one of the best titles in the Heroic Bloodshed genre. Review Just Heroes a.k.a. 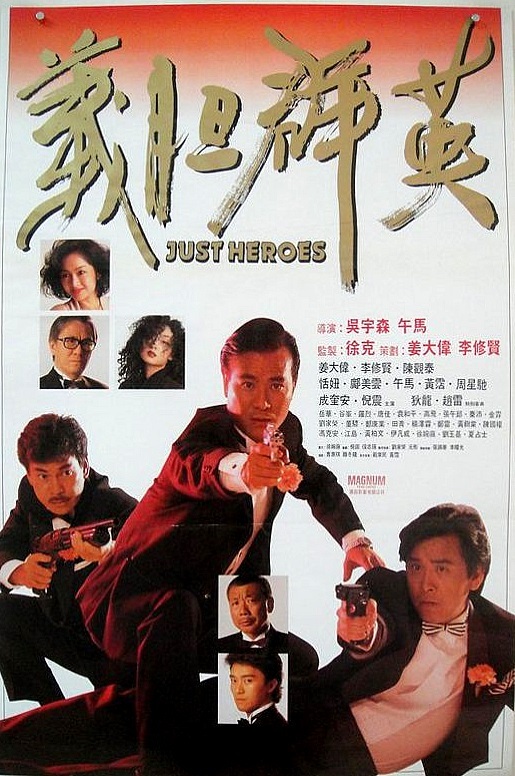 Yee daam kwan ying (1989): Believe it or not Just Heroes is one of the best titles in the Heroic Bloodshed genre. Just Heroes is probably one of the most overlooked titles that John Woo has made. And having seen the film a couple of times now I maybe can point out some flaws but even with those Just Heroes deserves far better recognition and praise. Because believe it or not Just Heroes is one of the best titles in the Heroic Bloodshed genre. 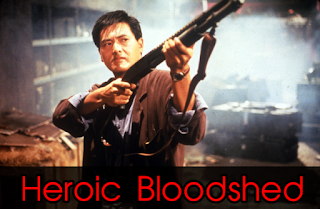 The film does not waste time to give us the action we expect from John Woo. Beautifully shot and amazingly choreographed. All of the action sequences are top notch. You will hear no criticism from me about those. John Woo even manages to parody himself referring to the famous scene in A Better Tomorrow where Mark (Chow Yun Fat) places the guns strategically in flower pots. Anyone who is capable of self-mockery like that is good in my book. Granted I am very forgiving when it comes to him since I simply can't get enough of how he views and shoots the action. Maybe a case can be made against it for the lack of real star power. Sure you have Danny Lee, David Chiang and a young Stephen Chow. Names that now have more weight to them then at that time. But even if you would regard them as big names they aren't a match for the enigmatic and charismatic Chow Yun Fat. He basically ruined it for a lot of actors to shine in similar roles. However for me it does not really matter if there are big names or not. Most important is that the action is good and that the story complements that action. And here is where things go horribly wrong. The story is far too dramatic, cynical and twisted. On the one hand it's quite dark and on the other hand it's light and comical. It gives the film an unnecessary confusing vibe and hurts the viewing experience at times. What is even more astounding is that the story is as predictable as they come. At a very early point you already know what is going on. This is because of some excellent Bad acting of one character in particular. He is not capable to display the subtleties his role requires. Not going to mention the name of this character. But you can be sure of it that you will know who I am talking about if you have seen the movie. Still if you can let go of the clichés and the melodrama then there are more than enough moments to keep you satisfied. Let's face it. Nobody is watching the films in this genre for the story or the drama. It's all about the action and in that aspect Just Heroes simply rocks. I prefer the action from this film over the American titles that John Woo was involved with any day, yes that includes the one starring Chow Yun Fat named The Replacement Killers. It's quite mystifying how superior Just Heroes is compared to The Replacement Killers. Even when you take into account all the flaws and the melodrama. Whether it is good or not it is filled with several themes and topics while The Replacement Killers can't even get the concept of friendship right. And on top of all the story telling (good or bad) it delivers on spectacular action that is satisfying every second of it. The Replacement Killers is average at best and yet which title is more popular. So do yourself a favour. Especially if you are a fan of the genre. Watch and praise Just Heroes if you have not done so yet and vow to never ever accept mediocre attempts in reviving Heroic Bloodshed.